Eric Prydz recently realised his new video for the track ‘Generate’. Over the last decade Prydz, whether through his studio productions or his live shows, has proven to be an artist concerned with aesthetic precision. Visually, just as he has musically, Prydz has created his own identity – even going to the point of being laser-scanned for his EPIC hologram shows, while producing hours of completely original 3D animation to accompany his performances. These are traits that have manifested themselves in his video output, and for his recent single ‘Generate’ Prydz partnered with GMUNK, a Director from San Francisco, whose credits include Hologram and UI work for Hollywood films Tron and Oblivion and also lead design for the Projection-Mapping project BOX. 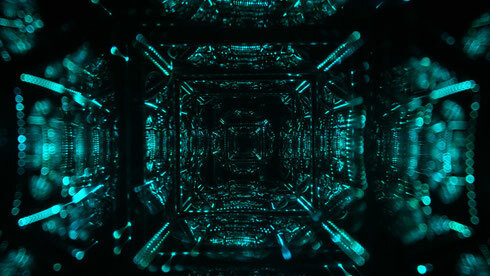 None of the video was shot using CGI, instead GMUNK collaborated with Symmetry labs, who created a physical modular 3D LED 'Sugar Cube' installation, which was essentially used as a light instrument. The cubes were augmented by a selection of concave and convex mirrors, while the team also built custom perforated tunnels and did refraction studies using silicon balls backlit by screens and projection. The result is an optical treat far more engaging than any green screen could produce, with a female protagonist encased in a seemingly infinite light ridden structure. The camera journeys down kaleidoscopic fractal tunnels. It’s a fitting accompaniment for ‘Generate’ which has seen Prydz top the Beatport charts for the third successive time.